What is a Home Care Packages (HCP)? 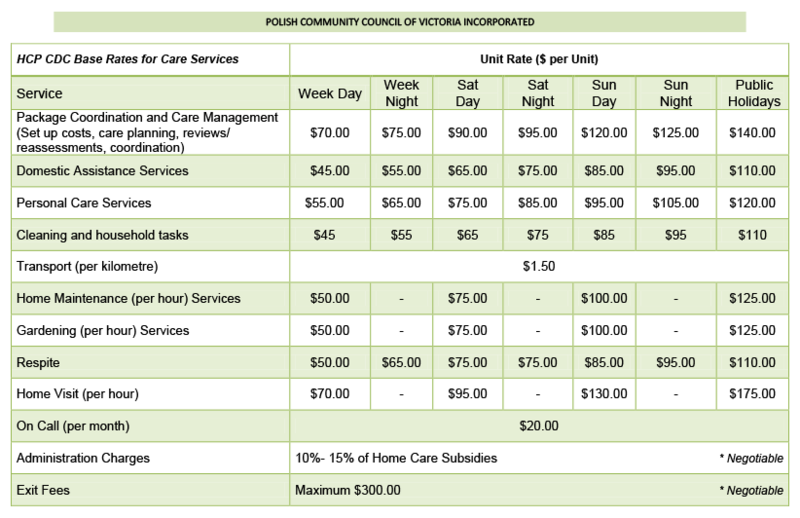 Polish Community Council of Victoria receives funding from the Commonwealth Department of Social Services to provide the HCP Program which is facilitated by the coordinator and professionally-trained staff – personal care workers. The goal of HCP Program is to contribute to maintaining and enhancing the security, independence and emotional, social and intellectual well-being of frail older people or younger people with disabilities, and their carers, assessed as in need of support. The program is designed primarily for the elderly of Polish descent living in Victoria. By providing proper care, clients of the program can remain independent for longer in their homes. Everyone has the right to lead an independent life, our program aims is to understand the needs of older people of Polish descent. One of the ways intended to support the needs of older people in their home are services tailored to the individual needs of our clients. How can you get into the program? The client must be assessed by the Aged Care Assessment Team (ACAT) to get help at home. ACAT helps older people and their carers, determine what type of care best suits their needs when they are no longer able to function independently. An ACAT team member, who can be a doctor, nurse, social worker or other health professionals, will meet with the client to assess the client’s care needs and determine appropriate services for the client. ACAT provide a letter to the client informing them of the type of subsidized services, which have been approved. ACAT can also help the client get in touch with organizations in the clients area that can provide the service. An ACAT assessment can be organised by the elderly person themselves by contacting My Aged Care on 1800 200 422. Our staff can also help to organise an ACAT assessment. After obtaining the opinion of ACAT enabling clients to receive help at home, and in the case of interest in Home Care Packages Program (HCPs), the client may contact the Polish Community Council of Victoria. If you have been offered a place, the coordinator of the program will establish a care plan tailored to your individual needs and the agreement is signed between the Polish Community Council of Victoria – Home Care Packages (HCPs) and the person receiving services offered by the program. What services are provided under the program? The services are based on the individual needs of the client. The Program Coordinator oversees the care and support services in the home, which are agreed between the client and the Case Manager of the program. Personal care (assistance with bathing, dressing, combing, shaving), etc. The scheme is regularly checked and adapted to the needs of the client. If there is a significant deterioration in the health of the client and help provided by us will not be sufficient, then a meeting is organized with the client to discuss if are there other possibilities for additional care which are adapted to new needs. Each person using the HCP Program is obliged to be charged for the aid he or she receives. Fees depend on the financial situation and needs of the client. an income-tested care fee if your income is over a certain amount. Rates of basic and income tested fees calculated as daily fees for a Home Care Package. Everyone taking up a Home Care Package can be asked by their service provider to pay the basic fee. Service Providers may charge the basic fee for a Home Care Package, including those delivered as Consumer Directed Care Rates of basic fees increase on 20 March and 20 September each year in line with changes to the Age Pension. This applies to each person receiving a Home Care Package, even if they are a member of a couple. Depending on income, home care package consumers may be asked by service provider to contribute more to the cost of their care. This extra amount is known as an ‘income-tested care fee’. The Department of Human Services works out the income-tested care fee based on an assessment of person financial information. The assessment does not include the value of person’s home or any other assets. People considering taking up Home Care Package can use our Home Care Fee Estimator (to help them estimate what costs Home Care Package provider may ask them to pay. The Fees for Home Care Packages and Residential Aged Care for People Entering Care from 1 July 2014 information booklet provides more details on Home Care Package costs. Home Care Fees are charged monthly, one month in advance. Consumers receive monthly invoices for service delivered under their Home Care Package. The costs for Home Care Packages changed on 1 July 2014. If consumers started to receive a Home Care Package before 1 July 2014 they will continue to pay the costs under the old fee arrangement. We are a friendly and professional organization. Home Care Packages are delivered on a Consumer Directed Care (CDC) basis. CDC gives clients more choice and control over the types of care and services clients receive, how care is delivered and who delivers it to the client. Under CDC, clients determine the level of involvement she/he would like to have in managing their own package. Clients will be provided with a personalised budget so that the client can see how much funding is available for services and how the money is being spent. To find out how to become a client in our HCPs program please call us on (03) 9569 4020 and ask o speak to Case Manager.